Thailand Visa Run to Aranyaprathet – Hot Asian Guys Everywhere you Look! Last year I had to do a visa run, so I thought that I would go to Aranyaprathet. I hadn’t been there for a few years and I noticed that there had been lots of development on the Thai side of the border but the Cambodian side is still basically the same apart from a few more casinos. The main thing that I did notice is there are so many good looking young Cambodian and Thai guys everywhere that you look. Many more than previous times that I had been there. All seem to be working… whether at the markets, moving stock around, selling things or helping tourists with VISAs. I couldn’t keep my eyes off them in their tight jeans and skimpy T-shirts. My Thai boyfriend was getting quite pissed off with me looking at them and talking to them all day long LOL! The first thing that you will notice when you arrive is lots of Cambodians crossing the border to sell goods at the Rong Gleua Market. 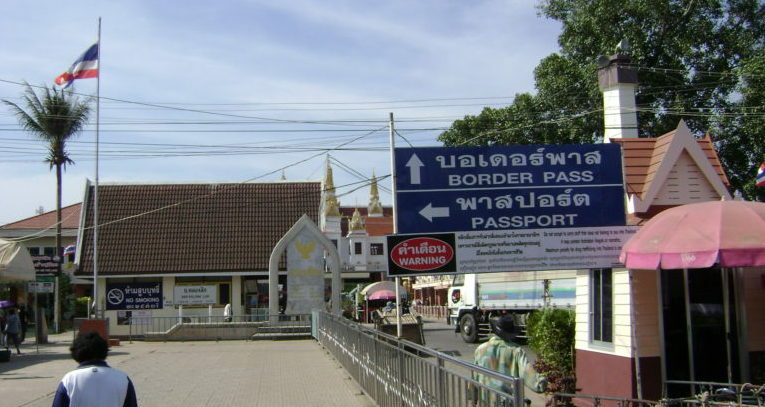 As you approach the border crossing you will notice that the Thai’s have built two new large buildings, one for departures and one for arrivals. Keep to the left of the road and enter the departures building. There were hundreds of Thais departing to play at the casinos and only a few foreigners in line. Hand the officer your passport and departure card and they will stamp you out. I noticed that the fine for overstays has changed and is now 500 baht per day. Exit the building and walk across the bridge that crosses the river. You are now into Cambodia. I noticed that the river was literally full of rubbish, much more than I have ever seen before, it was quite an eyesore. Once you cross the bridge, cross over the road to the right hand side of the road. Watch out for 10 and 18 wheeled trucks and carts racing towards you as they leave the Thai check point. Go to the Cambodia Visa office and apply for a Cambodian Visa. A simple one page form to fill out which you need to attach a photo to. Hand the form, your passport and 1,000 baht to the officer behind the window, wait about 5 mins and you will have a Visa sticker in your passport. Also ask for an arrival and departure card and fill that out. You now need to continue walking up the right had side of the road for about 500m to get to Cambodian arrivals. In that short distance you will notice about five casinos. Enter arrivals and hand them your arrivals card and passport. Tell them that you are going back to Thailand today and they will charge you 100 baht. If your staying a few days there is no fee. They will stamp you in, then cross the road and go to departures. They will stamp you out. Walk back towards Thailand keeping to the left. Once you get to Thailand arrivals ask for an arrival and departure card. Fill that out and enter the new building. Hand the officer your documents and if you don’t have a Thai Visa they will issue you with a Visa On Arrival (VOA) for 30 days. If you are re-entering on a multiple business Visa they will give you 90 days and if you are re-entering on a multiple tourist Visa they will give you 60 days. There is a limit on the number of VOA’s you can get in a row. According to recent reports its three. After that you will need to go to a Thai Embassy or Consulate outside of Thailand to get a Thai Visa. Whilst you are there, visit Rong Glua Market. Lots of clothing, shoes, kitchen ware and cigarettes. Everything is very cheap. I bought new Levi jeans for my boyfriend for just 250 baht a pair. Next story Hornet Gay Social App – You’ll Luv Having a Guy in Every City!